Salads are not only super healthy but majorly delicious, especially if you use a wide variety of ingredients. 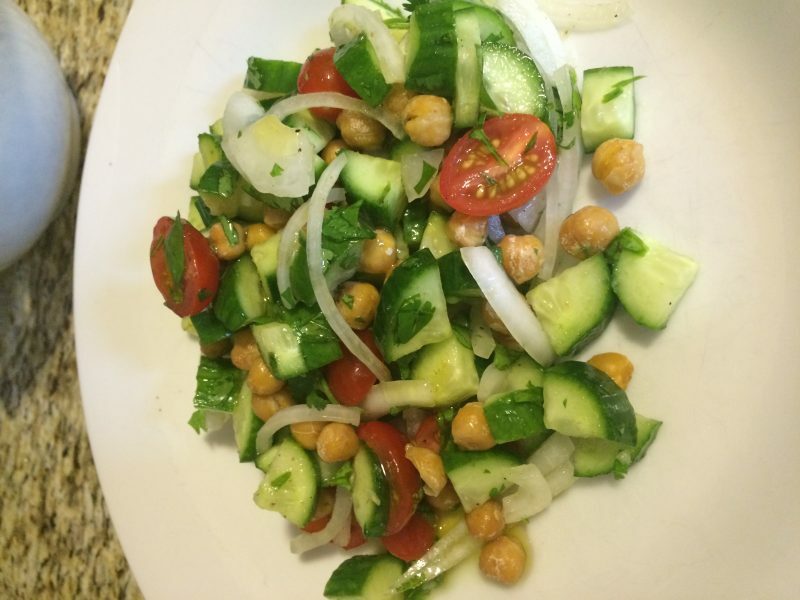 This Chickpea Cucumber Salad certainly has variety and lots of deliciousness! Heat large skillet over medium heat. Add extra virgin olive oil. Add chickpeas, and cumin and stir well. Cook chickpeas until warm and they begin to pop and turn a golden color. (You want the chickpeas to be golden but not overly crisp.) Add lemon zest, lemon juice and a pinch of salt. Combine cucumbers, tomatoes, onion and cilantro in a bowl. Add the warm chickpeas and stir until well combined. Serve with extra lemon juice and olive oil. Do you use canned chickpeas or uncooked chickpeas? Canned chickpeas can be used but for better flavor soak dried chickpeas overnight and then cook them in the liquid from soaking them.